It doesn't take more than one 100° day spend waiting for a train in Roseville or Colton to get you at least thinking about riding in some other time of the year. The mere presence of shade can determine where you'll hang out to wait, or which side of a string of cars you'll walk along. 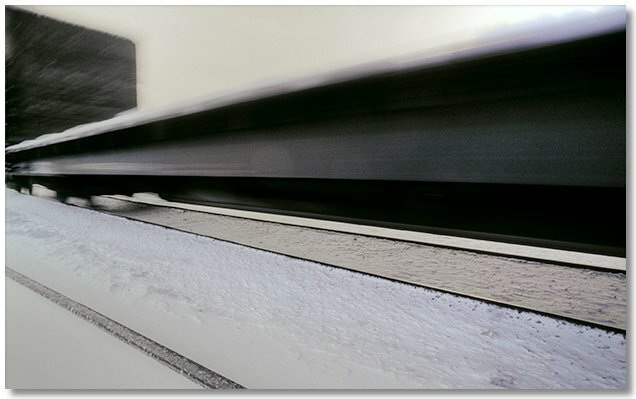 Riding on the back end of a grainer going north, or baking inside of an all-black gondola crossing the desert and your thoughts are of someplace... anyplace else. Certain facets of train riding remain relatively unchanged, however. I'll bet that a similar amount of time is spent keeping your water jug cool in the summer as is spent keeping it from freezing in the winter. It's the trains themselves that remain constant — something familiar admidst unfamiliarity and the unexpected. During one particularly long stretch of bad weather I wrenched myself from the boredom of being housebound and packed up for a trip to Eugene. 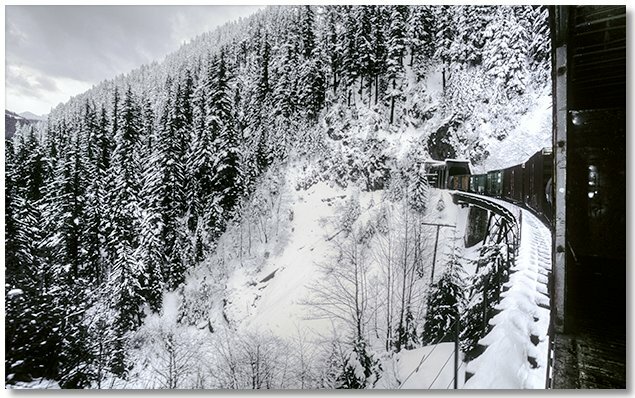 This was a relatively "easy" winter trip as there were always empty boxcars on the way up and if there was nothing that appealed to me on the ride back I could always chicken out and take Amtrak. Driving down to Dunsmuir in a light but steady rain I tried to mentally prepare myself for the certain unpleasantness that would begin soon enough. I cranked the heater up to pre-warm as many items of clothing as I could, knowing that it wouldn't last long once I began the walk down to the yard. That "walk" was actually quite pleasant as the rain let up seemingly the instant I parked my truck. 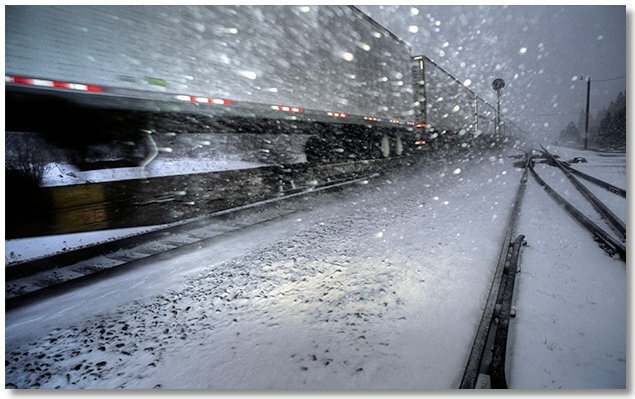 The feeling was rather fleeting, as I was soon passed by a southbound freight entering the yard with a large coating of snow on the front end. I did, however, over-indulge in bringing along food and drink, so any extended stays huddled under dripping pine trees waiting for a train would be as enjoyable as possible. Presently a striking similarity to my old hitchhiking days manifested itself — there seemed to be some unwritten law that stated that the time spent in making an eye-catching hitchhiking sign was inversely proportional to the time spent waiting for a ride afterwards. Once when I was trying to hitch out of Davis I spend 15 minutes or more creating a large, colorful, easy to read sign stating my destination, only to have a driver stop for me before I even had a chance to hold it up. I almost reluctantly climbed in, secretly wishing that I had more time to show off my handiwork. In my current situation, I had enough food to survive a week in the yard, but just a few minutes after I sat down on my cardboard to kick back I heard a train whistle [honk?] for the road crossing at the south end of the yard. The train slowly pulled past me on the main, and as if on cue, as soon as I left the sheltering pine canopy above my head it started to rain again. As I hoped, shortly one after another empty boxcars crawled by, saving me a walk on the slippery ballast, and when the train finally stopped I had several cars to choose from right in front of me. All of them had both doors open, but one in particular had a large chunk of that honeycombed cardboard inside, and I quickly climbed in and began constructing a cardboard "throne" from which to sit upon and gaze out over the soon to be snow-covered landscape. With enough cardboard and a sharp knife one can create beauty from chaos, or in this case, a comfortable chair with a reclining back. I even added a personal touch by deftly removing a cylindrical chunk on the side to hold my wine bottle. Some quickly made gordita and cheese roll-ups and I was ready to rock and roll. Fortunately, rock and roll we didn't as once we got moving it was a very smooth but noisy ride. Stuffing in my foam earplugs and opening a ceremonial bottle of White Port, I stood at the doorway and watched the roily Sacramento River go by below as we wound our way up to Mt. Shasta, where the increased speed made be seek shelter in my wind-free throne. At Black Butte the snow began but by that time I was warm and reasonably dry, so I sat transfixed before the 10' long big screen TV's on either side of the car. It was early afternoon when we got to Klamath Falls, and a quick crew change further enhanced the delightful ride I was enjoying. 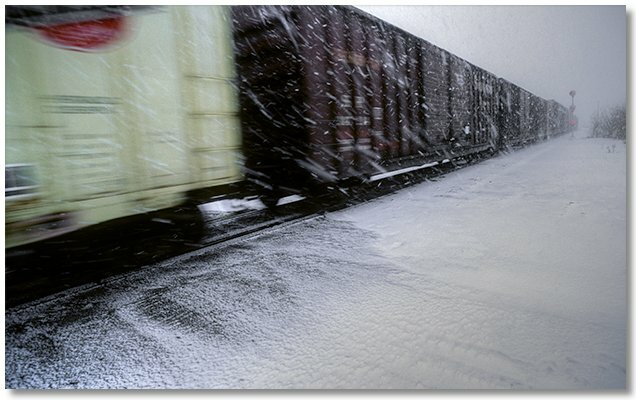 I realized just how lucky I was when a southbound we passed on a siding had the porches on grainers covered with snow. Passing Chemult we slowed for the grade up the east side of the Cascades and since my light was fading (and my hands were freezing) I rolled out my sleeping bag and drifted off to sleep. Waking up to pee near the summit I noticed that the unplowed snow was up to the floor of the boxcar. The ride down the west side was faster and not quite as smooth due to constant slack action, but a second bottle of wine smoothed out the bumps. The clanging crossing bells in Eugene woke me up around midnight and I rolled up and prepared to enter the monotonous drizzle that is western Oregon at this time of year. Dropping off under the Maxwell bridge to escape getting soaked, I made my way over to the west side and rolled out again under the overpass, again thankful that I had some cardboard to put down first. The next morning was rainless and almost clear, and again a passing hotshot that just came down the hill had the plow and walkways covered with snow. I couldn't remember where to catch the inbound bus and since it wasn't raining I decided to walk into town. My first stop was the Greyhound station, not to check out bus schedules but to stash my pack in a locker, then, feeling streamlined, I made my way over to IHOP for one of their unforgettable breakfasts. I'm glad that there wasn't an IHOP franchise anywhere near where I lived, or I'd probably weigh 300 pounds! Noting in the morning paper that rain was forecast for today, tomorrow, and who knows when, so my next stop was to purchase a ticket on Amtrak for the ride back. It ended up being a very well spent $33, as the clouds were now blocking out what little sun was available earlier. Next on my walking tour of Eugene were a few thrift stores, a used record store, and the big used book store across from the Post Office. I managed to milk the book store for all it was worth, then went back over to Greyhound to retrieve my pack. As much as I would have preferred to take a freight back, they usually left too late to see any scenery going over the Cascades and most (and sometimes all) rides were "outside", requiring either a death wish or several bottles of wine, or both. The southbound Amtrak would get to Eugene in the late afternoon and get me back to Dunsmuir shortly after midnight, if this was the one day in a hundred years that Amtrak was on time. Since I would be surrounded by "people" on this leg of the trip, I added a precaution allowing me to enjoy White Port freely and avoid the $5 beers onboard. Before I left home I packed an empty plastic bottle of Schweppes Ginger Ale — the dark green plastic would allow me to fill it with White Port on the train and no one would be the wiser. The train arrived remarkably close to the advertised, and I stashed my pack after taking out the Schweppes, which would be my constant companion for the ride back. As luck would have it, the lounge car was filled with a garrulous crowd of people returning from an Operation Lifesaver Convention. These people were my nemesis — their holier-than-thou attitudes concerning safety around railroads made me want to barf. If they had their way, you'd have to stop your car a quarter mile back from the tracks at a crossing, in case a small piece of sawdust falls off the train and strikes your vehicle. Feeling emboldened from my Schweppes diet, I engaged a couple of guys in a conversation that began as my sincere admiration for what they stood for in regard to crossing safety, but soon segued into questions about "hobos and tramps" riding trains, and the danger they represented. My baiting brought forth a tirade about how to "deal" with unlawful riders that could have progressed into a full-blown riot if I'd continued, but I skilfully took their side in response to those who would dare to hop aboard a freight train. 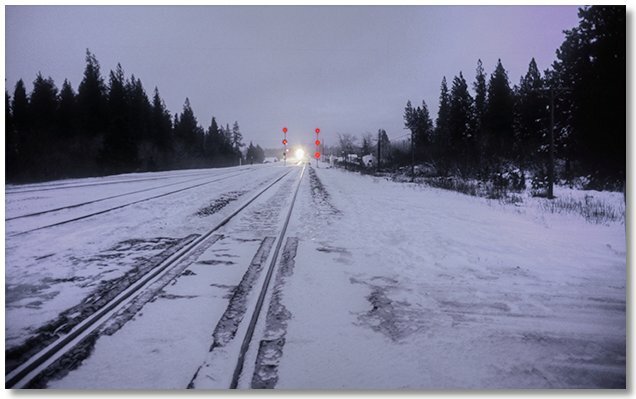 To hear them tell it, merely standing next to a stopped train will surely cause it to overturn and crush you. Once I got them going I just sat back and enjoyed my "ginger ale" while they worked themselves into a frenzy. Bored with the morons in the lounge, I made my way back to my seat, which proved to be quite an undertaking owing to the fact that I hadn't really made any kind of a mental note as to where "my" car was in relation to the lounge car, and whether it was forward of the lounge or to the rear. It was even difficult to tell which direction I was travelling, as the practice of keeping the interior lights of the cars on made it almost impossible to see outside at night. This, coupled with an over-indulgence in "ginger ale", made it a very time-consuming journey getting back to the right car. Once back to familiar territory I took off my boots and curled up for a nap, only to be awakened minutes later by the stop in Klamath Falls. Not bothering to put my boots back on, I made my way down to the lower level and stepped outside to stretch my legs, only to realize that it was probably in the teens or twenties outside with the ground covered in snow and ice, so I quickly retraced my steps and continued to nurse my Schweppes in the coach car. In a few hours we began the descent into the Sacramento River Canyon and I laced up my boots and walked downstairs to get my pack. Outside it was raining again, but I knew of a nice sheltered spot next to the depot to roll out in after I got off the train.